Updated with more evidence of the anti-vaccination cult hatred. This is part of my series of opinion pieces. As I’ve written, it is not meant to be supported by evidence or data – unless I link to evidence. Then it is. On the other hand, my opinions are based on tons of reading and data, so there’s that. The more I get involved with the false debate in the world of vaccines, the more I realize how much the anti-vaccination cult hates autistic children. Sadly, they’re not hating the neurological disorder, but the children who have it. Why else would the cultists choose to expose their children to deadly preventable diseases by not vaccinating, because of a ridiculous, and unsupported, belief that those vaccines cause autism? Especially, since there isn’t one single real study that’s ever shown that autism is related to any vaccine! You have to wonder if some anti-vaccine parents would rather have their children die rather than take some non-existent risk of having their children be diagnosed with autism spectrum disorder. Then there’s this uninformed junk from the Age of Lying About Autism – measles is so much better than autism. I’ve written about this more than enough times that I can quote it in my sleep – measles is dangerous. It can lead to many chronic conditions including death. So, the ignorant cultists at the Age of Autism obviously prefer children who might die of measles to ones with autism. Even if there is absolutely NO evidence that vaccines, which prevent these deadly diseases, have any relationship whatsoever to autism. 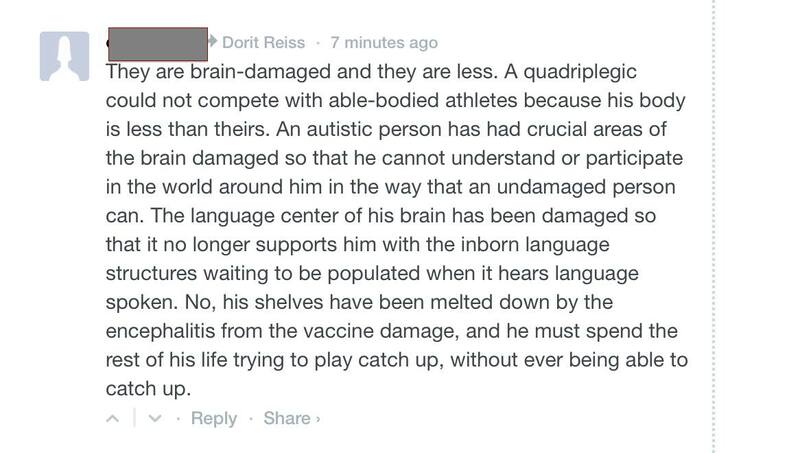 Dorit Rubinstein Reiss, a frequent contributor to this website, provided me with screenshots of some of the more ludicrous comments about autistic children and vaccination. No it’s not. Autism is a psychiatric diagnosis that requires intensive screening, and includes a spectrum of neurodevelopmental disorders. Lying about autism is simply a lie. This comment perfectly illustrates what I’ve continued to say about much of the anti-vaccination movement. They are generally, but not always, privileged white people who think that their children are genetically superior to everyone. Their hatred of those who are less than perfect, whether quadriplegic or “brain damaged,” is clear. This is why many anti-vaccination pushers reject arguments that unprotected children can be harmful to those who are immunocompromised. They think that they have no responsibility to those who, by the luck of the draw, have a compromised immune system, an inferior child compared to their own genetic wonders. Part of the reason, I believe, that many of the anti-vaccination cult blame vaccines for autism is because they fundamentally believe that something caused the autism – it couldn’t possibly be the contribution of their genes to the child. Because they are white-privileged superior human beings, and they could only produce white-privileged superior children, so it’s the vaccines! By the way, autism is not “brain-damage,” unless you’re completely ignorant and hateful. Look, I’m not a fool. Parents with autistic children have many stressors and complications to their lives to provide the help and education to their children. Much higher than the usual stressors and complications to parents lives with most children. But preferring dead children to autistic ones? Many, maybe even a majority, of autistic children grow up to be high functioning, brilliant adults. Many lead wonderful lives, with loving relationships, productive careers, and beautiful friendships. I realize that many children within the autistic spectrum have difficulties, and may need caretakers for the rest of their lives. I volunteer a few hours a month, helping parents of autistic children apply for benefits from the Federal government, which can make a huge difference. Sometimes, the right education and the right assistance can make all of the difference. But the worst part is that the anti-vaccination cult fall for that old logical fallacy – the false dichotomy, which presumes that there are only two choices. The facts are that there is no evidence that vaccines cause autism (really, there is none), and there is solid evidence (mountains of it, in fact) that vaccines prevent deadly diseases. So the choices really aren’t between two separate ones – preventing your child from having autism and keeping them safe from disease. You can vaccinate your children without ever worrying about an increased risk of autism and protect them from disease, which are both supported by real science. By ignoring the real evidence, the anti-vaccination cult is actually creating the false dichotomy out of nothing. Well, that’s the problem with logical fallacies, they are almost always created out of nothing because the arguer lacks evidence. Maybe, not every autistic child will grow up (barely) to get a PhD in astrophysics. But believing in the myth that vaccines cause autism can lead to many children, autistic or not, to die. The anti-vaccination cult needs to pull their head out of the sand, and realize all children are special, and all should be protected from vaccine preventable diseases.